In a large thick bottomed pot, soften the diced onion and diced celery and pressed garlic in olive oil. This is where you would add the splash of white wine if you want. I used baby portobello mushrooms this time. Slice the mushrooms and cook them separately – Don’t crowd the mushrooms! When the onions are soft, add the rice to the pot and stir until rice has absorbed the oil and becomes transparent. Add just enough broth to cover the rice. Allow it to boil uncovered until the rice has absorbed all the liquid. Continue adding broth to keep the rice moist until it is thoroughly cooked 15-20 minutes. 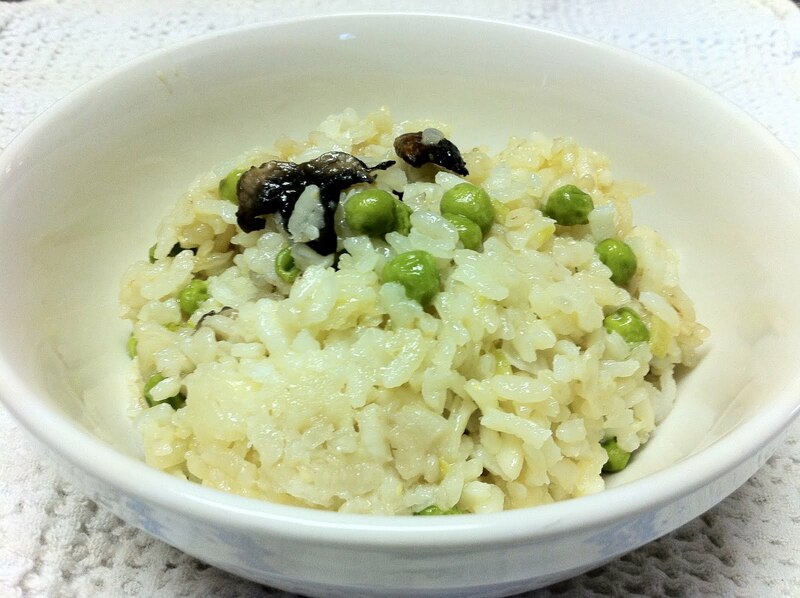 The risotto should be slightly firm and creamy, not mushy. Stir in the dollop of sour cream, peas, mushrooms and then add the grated parmesan. Stir well. Dress with sprigs of parsley, and serve steaming hot! *I made this without broth the other day, I just used water. Turned out great!